Wildlife in a Suburban Garden: trichomoniasis. Read about it and it's prevention here. On a personal note, we have not noticed a particular shortage of Greenfinches, they have been scarce in the garden this year though. Last year they were the most predominant species in the. I am told by my ornithologist contacts that the disease appears to affect small random populations. 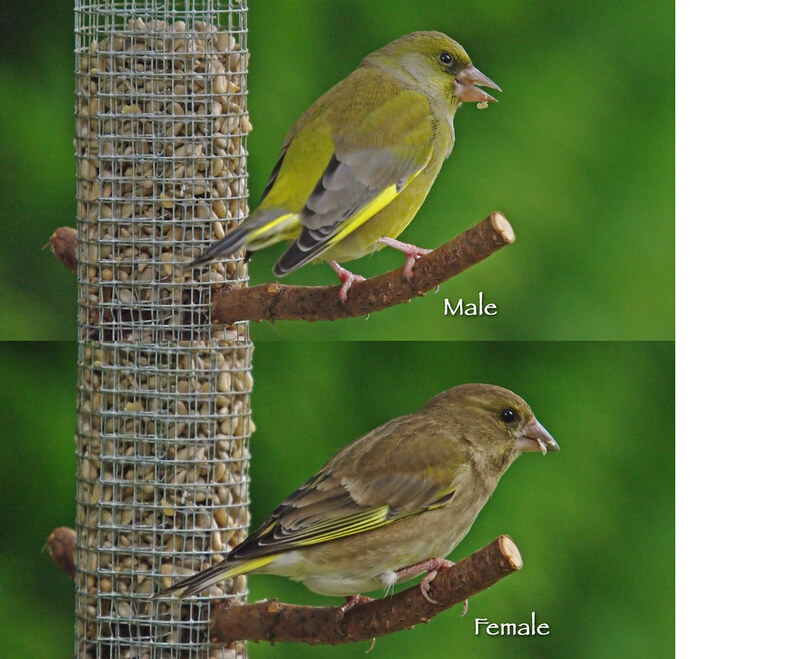 In one area Greenfinches will be absent but only a few miles down the road there will be no noticeable difference in populations. I was quite pleased to have them with me today because I have noticed, or it appears to me that Siskins tend to "travel" with them and I am pretty certain that the Redpoll that we had last February was in the company of Greenfinches. I therefore got a little excited when they put in an appearance, I was hoping for at least Siskins. So what about today in the garden? Well we had the first Starling - Sturnus vulgaris actually settle in the garden. I remember a day when any feeding station would have been absolutely flooded with dozens of them but those days seem to have gone. Now they are always around but in far smaller numbers and they have never been into the garden this year apart from on the house roof. I was therefore a bit surprised when one suddenly appeared in the cameras viewfinder. Today has been so so cold for this part of the UK. We just so rarely have consistently bitter cold weather for such long periods. Sometimes we will go for weeks in winter without as much as a frost but not this year. I wonder what next year has in store for us. Oh, by the way a Happy New Year to You!!!! The cold weather has started to affect the feeding behaviour of the birds around the feeder. 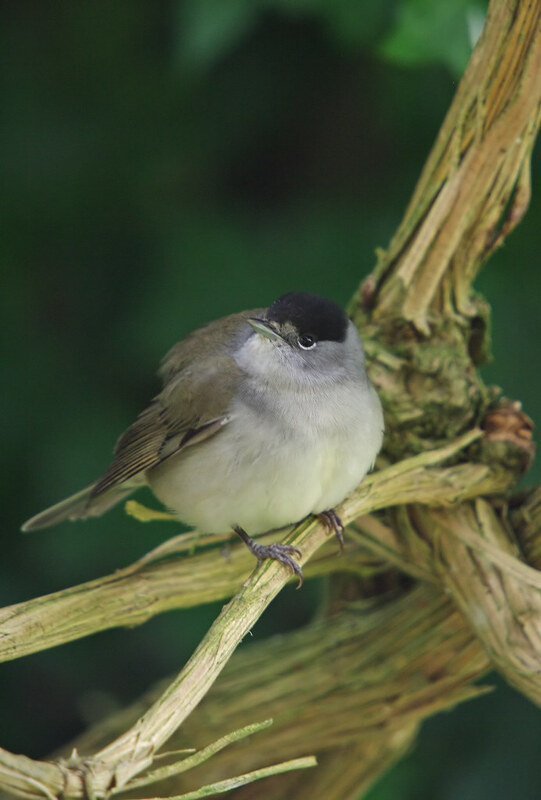 Even the Blackcap has been getting aggressive as he tries to defend his food, or so he thinks. He perched on the feeder, the first time I have seen him do that. Then he came on to the bird table and took away a mealworm and then later a chunk of Cheddar Cheese! It looks as though he chased away the hen which would explain why I have not seen the two together. He perched above the feeder and tried to protect it from the Goldfinches and at times he was successful but had to give way when a Blackbird came on to the scene. I almost captured the "fight scene" but bad light and photography doesn't mix. But here is the scene anyway. I noticed an alarm call from the Blackcap which was remeniscent of a wren but not as low pitched or as loud but it is certainly a call that I will be able to recognise when I hear it again. I was pleased that I managed to pick up on this as it a new piece of information learned.